Christine Beatty listens as lawyers discuss Mayor Kwame Kilpatrick’s guilty plea at the Frank Murphy Hall of Justice in September 2008. Christine and Kwame were charged with perjury and obstruction of justice in the Gary Brown whistleblower case. Courtesy of the Detroit Free Press. 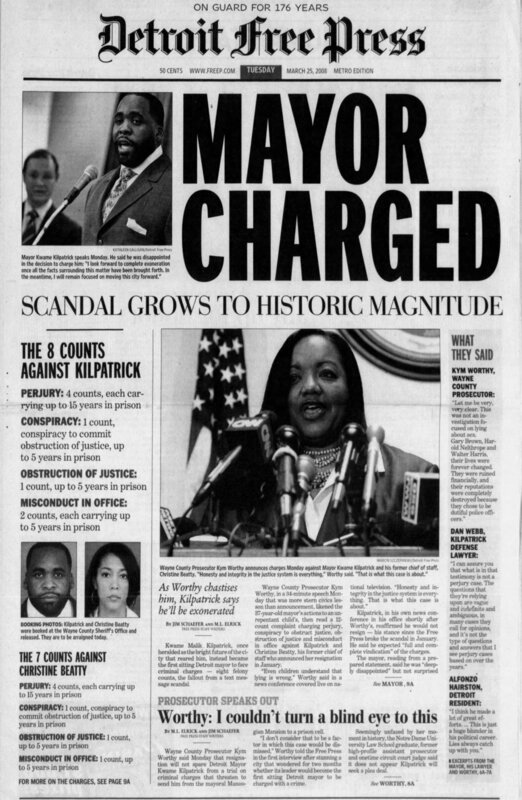 The revelation that Mayor Kwame Kilpatrick had an affair with his chief of staff — a romance detailed in thousands of explicit text messages — rocks Detroit. But it’s only the beginning of their troubles. Kwame Kilpatrick and Christine Rowland first met while attending Cass Technical High School together in the 1980s. Cass Tech is a magnet school, and the most prestigious public high school in Detroit. Courtesy of the Detroit Free Press. 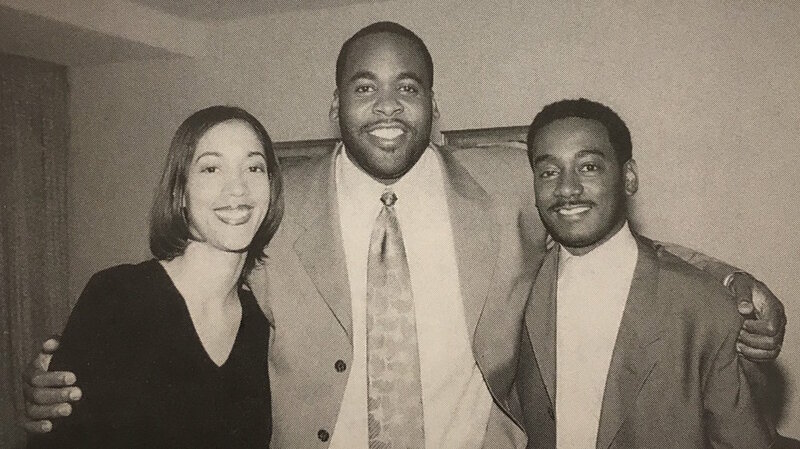 Christine (née Rowland) Beatty, Kwame Kilpatrick, and Derrick Miller were close friends when they attended Cass Tech. After Kwame was elected mayor, he appointed Christine as his chief of staff, and Derrick as his chief administrative officer. Courtesy of Kwame Kilpatrick. Kwame Kilpatrick briefly dated Christine Rowland in high school, but broke up with her before leaving for college. 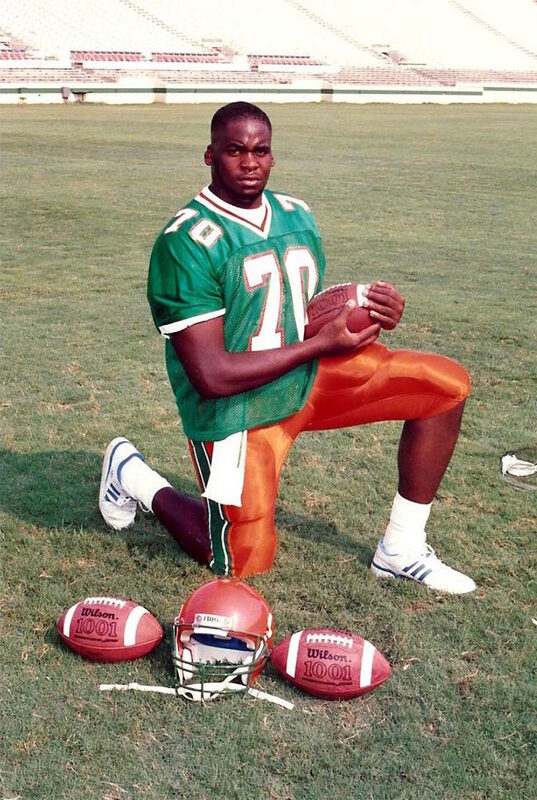 Christine went to Howard University, while Kwame attended Florida A&M University, where he played football. Courtesy of Kwame Kilpatrick. Derrick Miller and Christine Beatty at a community reception at Cass Tech during Kwame Kilpatrick’s inaugural ceremonies in 2001. Courtesy of the Detroit Free Press. As chief of staff, Christine kept tabs on numerous city departments, including the Detroit Police Department. Here, she attends a 2002 press conference held by Police Chief Jerry Oliver, who would go on to testify in the Gary Brown whistleblower lawsuit in 2007. Courtesy of the Detroit Free Press. Kwame often worked long hours at the office with Christine, left, and his aide DeDan Milton, right. He and Christine would often stay late after work to talk. Courtesy of the Detroit Free Press. 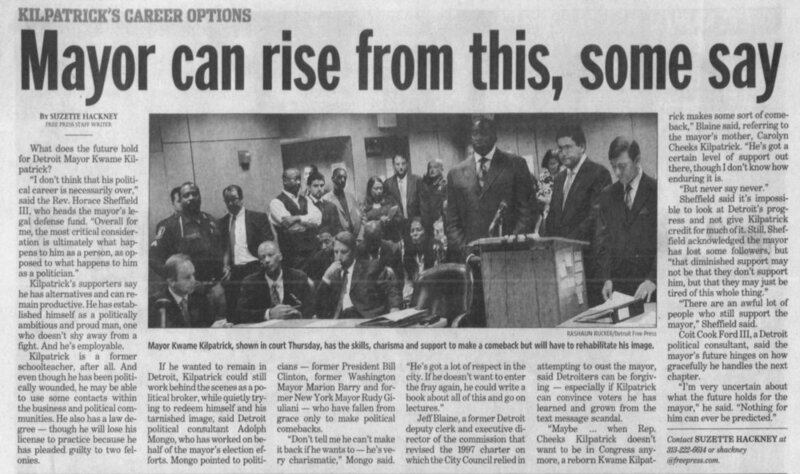 Kwame Kilpatrick announces his run for mayor in 2001, with his wife Carlita at his side. Courtesy of the Detroit Free Press. Carlita and Kwame Kilpatrick hold their new son, Jonas, just weeks after Kwame was first elected mayor in 2001. Courtesy of the Detroit Free Press. Christine talking to reporters in 2005. As chief of staff, Christine developed a reputation as a relentless defender of the mayor. Courtesy of the Detroit Free Press. Kwame hugs his twin sons Jelani and Jalil on the campaign trail. Christine and Kwame were close with each others families, attending birthday parties and buying Christmas presents for the kids. Courtesy of the Detroit Free Press. Chief of Staff Christine Beatty listens as Detroit Mayor Kwame Kilpatrick gives his State of the City Address in 2005. Courtesy of the Detroit Free Press. Kwame Kilpatrick with his wife Carlita and their twin sons Jelani and Jalil at Kwame’s swearing-in ceremony during the 2006 inauguration. Kwame’s relationship with Carlita grew strained due to his demanding schedule. But during the 2005 election, the couple decided to work on fixing their marriage, and Kwame says that broke off his affair with Christine. Courtesy of Tim and Tobias Smith. Christine is confronted by reporters while making her way from the 36th District Court in Detroit in May 2008. Lawyers representing Christine and Kwame were able to push back their preliminary hearing until September, which allowed Kwame to delay decisions about making a plea deal or resigning. Courtesy of the Detroit Free Press. Christine shakes hands with Kwame in the 36th District Court in 2008. Courtesy of the Detroit Free Press. Crimetown is Marc Smerling and Zac Stuart-Pontier. This season is made in partnership with Gimlet Media and Spotify. This episode was produced by John White, Soraya Shockley, Rob Szypko, and Samantha Lee. The senior producer is Drew Nelles. Editing by Zac Stuart-Pontier and Marc Smerling. Fact-checking by Jennifer Blackman. This episode was mixed and scored by Robin Shore. Original music this season composed by Homer Steinweiss. We recorded some original music at Rustbelt Studios in Detroit in partnership with Detroit Sound Conservancy. Special thanks to Carleton Gholz and Maurice “Pirahnahead” Herd. Additional music by John Kusiak, Kenny Kusiak, Jon Ivans, and Bienart. Additional mixing by Bobby Lord. Our theme song is “Politicians In My Eyes” by Death. Our credit music this week is “Game Time” by Phat Kat. Archival research by Brennan Rees. Archival courtesy of Tim and Tobias Smith. They have a film called “KMK: A Documentary of Kwame Kilpatrick.” Archival material courtesy of the Walter P. Reuther Library at Wayne State University and WXYZ. Show art and design by James Cabrera and Elise Harven. We made a Spotify playlist featuring music from the show and songs that have inspired us this season. Check it out at crimetownmusic.com. Thanks to the Detroit Free Press, Peter Bhatia, Jim Schaefer, Mary Schroeder, Melanie Maxwell, Mary Wallace, Elizabeth Clemens, Max White, Randy Lundquist, Erick Hetherington at D&D Video, ML Elrick, Devin Scillian, Melissa Samson, the Charles H. Wright Museum of African-American History, the Detroit Historical Society, Brendan Roney, Khary Turner, Mike Martin, Zak Rosen, and everyone who shared their stories with us.